This is Adventure Corner, where we review and discuss the most popular adventure maps. We've all come to know the hit game Assassin's Creed, but forum members Selib and DrChriz decided to put a Minecraft-style twist on the bestselling series. How, you may ask? Parkour. 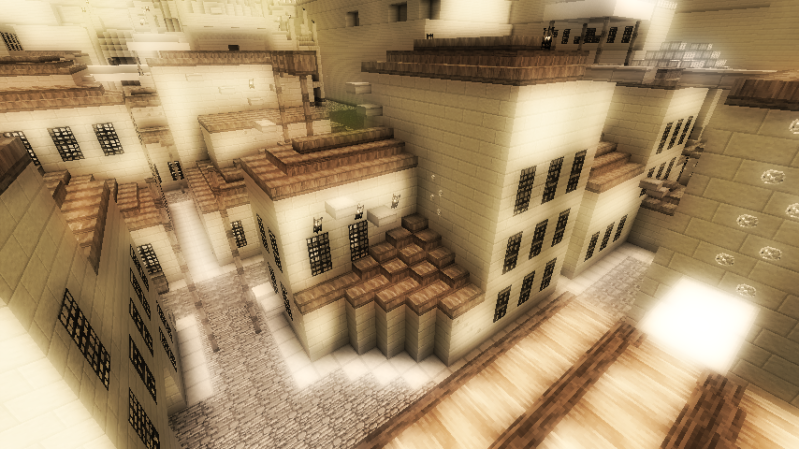 Assassin's Creep is a beautiful parkour map when you use the Assassin's Craft texture pack along with it. It has a variety of jumping puzzles from building-jumping to timed piston jumps. The goal of the map is to find and collect all 9 pieces of colored wool. There are markers in the sky to show you the general location in which the wool is located, so you're not completely left to roaming around to find the wool. From my opinion, playing it in singleplayer left me feeling a little lonely. There is literally nobody else but you in this open world. I would have liked to see some trading mechanics or just roaming villagers. Maybe even some easter eggs in this open world. Personally, I found this adventure map most enjoyable when I was with friends. With the added excitement of competition, this "see who can get the most wool" variation really added that sense of rush and excitement that this map needed. Notes: It is recommended that you use Assassin's Craft resource pack which can be found here. Might have to try out this one! This is awesome for your first post! Keep it up! It's an okay (And relatively old) parkour map, but compared to all of today's mini-games and adventure maps, not to mention all the jump maps, it's really not that great, without the Assasins Creed theme, but loved the post, keep them up. I would love to see a review on hypixel's and sethbling's stuff! Also, a 8/10 is kind of high, because I'm gonna bet ANYTHING with friends is gonna be pretty high. I personally might rank it like, a 5 or lower, singleplayer. It was difficult to judge the scale for this one around, as Corbin gave out all high scores for all the previous maps, so I was a bit hesitant on grading it harshly. But alas, I will use my scale next time! Thanks! When I do the judging, I look to see how it was at the time of release. They didn't have command blocks when this map was created as well as not having all the materials/tools that Minecraft has today, so I was sure to grade it with that in mind. Also, I'll look into some hypixel and sethbling maps for future reviews!